On a recent Sunday evening I made dinner for my husband and myself. It was fresh, healthy, and not pasta, tacos, pizza, or burgers, but when we finished eating he said "Wow, that was really good!" This is a big deal, people. 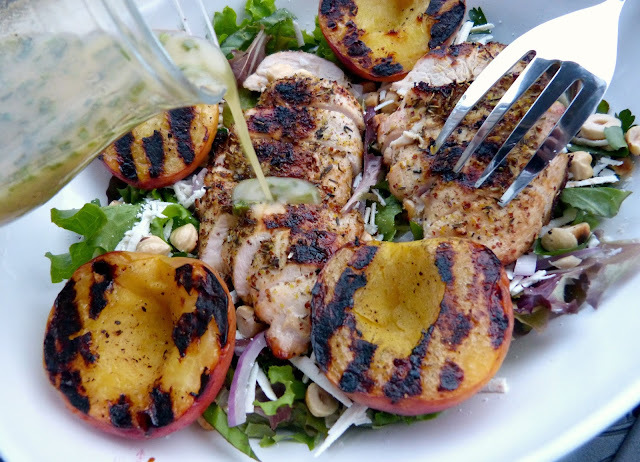 That dinner was this grilled chicken and peach salad and it's one of my favorite new summer recipes. I'm pretty sure the only other time Alex has had this kind of reaction to a salad was when I made this fresh heirloom tomato salad last summer, so I'm guessing this is a once a year occurrence. I'm going for two in 2015 though, so stay tuned! I loved a good dinner salad in the summer that's filled with hearty ingredients and complimentary flavors. Seasonal produce lends a really great fresh flavor to this salad and the addition of marinated chicken, toasty hazelnuts, and salty ricotta salata is a perfect match for these sweet caramelized peaches. And to top this whole salad off: A new favorite dressing. I love the delicate flavor of champagne vinegar and have found myself using it a lot recently in summer recipes. This vinaigrette has a very French feel with the champagne vinegar, spicy Dijon mustard, a hint of sweetness from honey, and a generous sprinkle of chives. 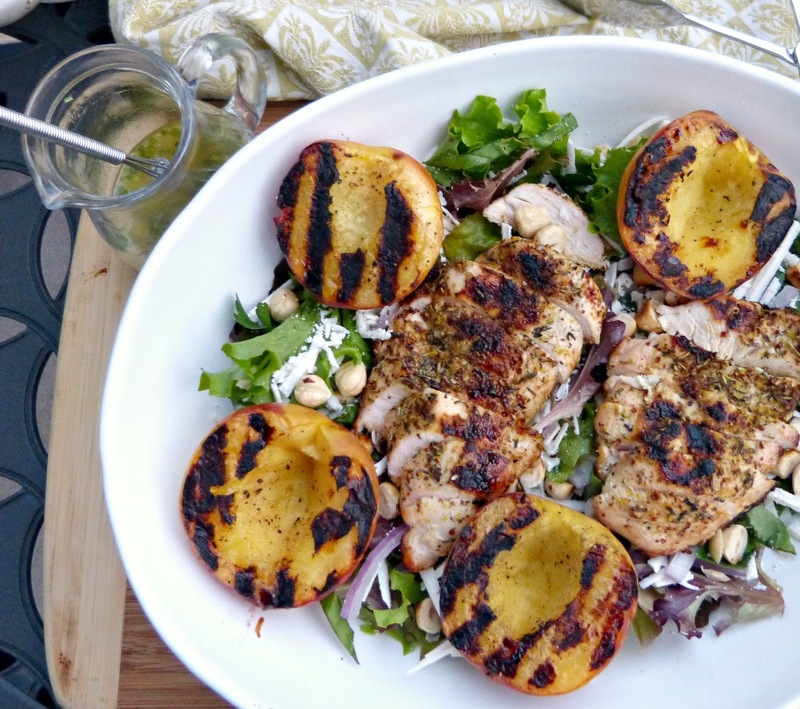 It's a subtle tangy touch to this sweet and savory salad. Not to toot my own horn (toot toot), but beyond the flavor of this salad I really love the way that it looks! 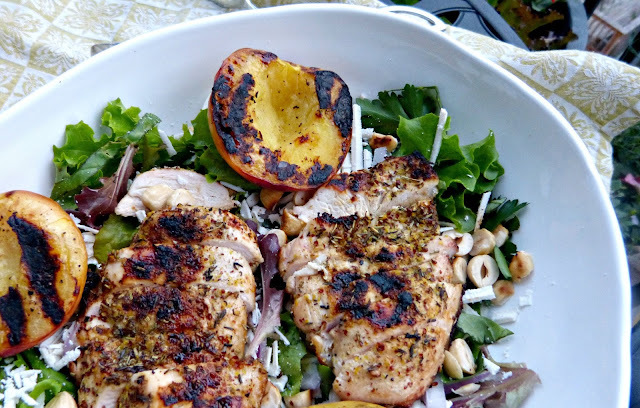 The slightly charred vibrant peaches, bright greens, and pops of whites and purples... it's a really good looking salad. It's also pretty easy to assemble, so you could serve this one at a summer dinner party and wow your guests without question. In a large zip locking plastic bag, combine chicken, dry seasoning, salt, pepper, lemon juice, and 1 Tbs. olive oil. Seal bag, releasing excess air, and refrigerate for at least 30 minutes. Preheat the grill to medium-high heat. Remove chicken from marinade and discard excess liquid. Grill the chicken 5-6 minutes on each side or until cooked through and the juices run clear. Remove from grill and allow to sit for 5 minutes before cutting into 1-inch slices. Reduce grill heat to medium. Use a pastry or basting brush to apply a 1/2 Tbs. of oil evenly on the flesh sides of each peach half. Place the peaches on the grill cut side down. Grill until softened and grill marks begin to appear. Turn the peaches over and grill on the skin side for an additional 2-3 minutes and remove. In a small bowl, whisk together Dijon mustard, honey, vinegar, chives, and salt and pepper. Stream in remaining olive oil while whisking until the mixture is completely combined. Place greens in the bottom of a large serving bowl. 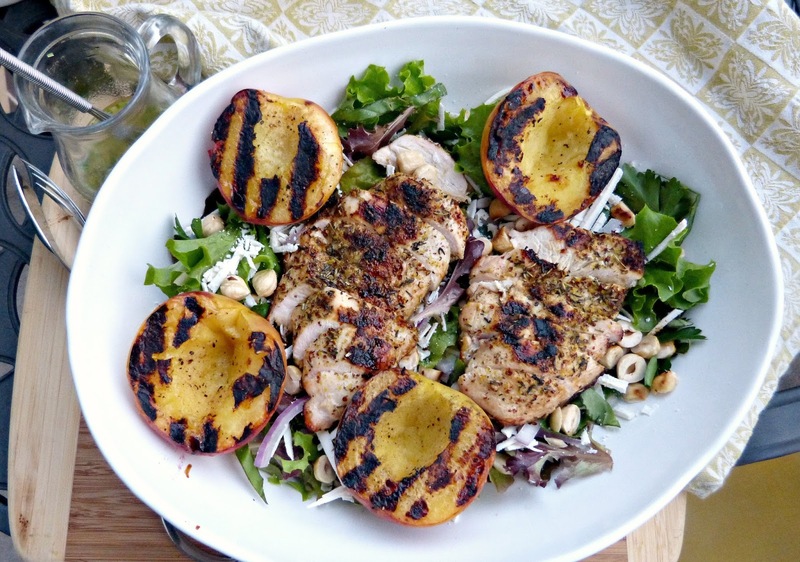 Top with sliced grilled chicken and the grilled peach halves. Sprinkle evenly with red onion, basil, chopped hazelnuts, and ricotta salata. Serve with the vinaigrette.